A government experiment on diseased bison herds in Yellowstone National Park shows that non-infected members of the herd can be safely removed and used to start new herds -- good news for a species that was once on the brink of extinction. Every year for the past two decades, government workers capture and slaughter thousands of migrating bison to prevent them from coming into contact with cattle herds in Montana because about half of them have brucellosis, a disease that causes pregnant animals to lose their fetuses. By capturing and putting park bison into quarantine, the animals could be declared brucellosis-free within three years, or even sooner with calves and male animals, according to researchers from the U.S. Department of Agriculture's Animal and Plant Health Inspection Service and the Wildlife Conservation Society. 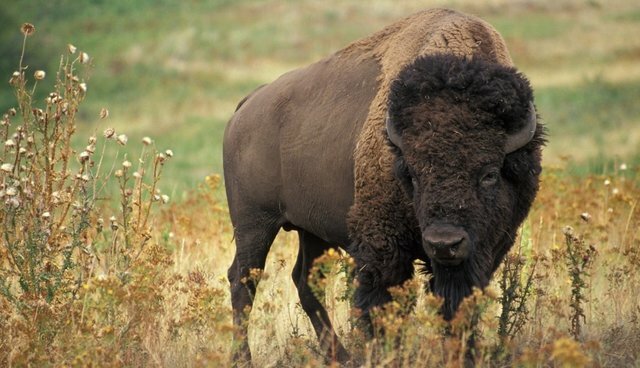 Advocates say that means Yellowstone could be used as a supply source for establishing bison herds on public and tribal lands across the West. "This will help defuse the argument about brucellosis, that the animals are carrying brucellosis and will give it to cattle around them," wildlife pathologist Jack Rhyan of the health inspection service told AP. "I'll feel more positive after 1,000 animals have gone through. That's just caution because this disease sometimes crops up where you never think it can." Already this winter, over 200 of the 4,600 bison in Yellowstone have been killed, and 600 to 800 are expected to be killed in total. If healthy bison can be removed from the herd and new disease-free herds can replace diseased ones, there would no longer be a need for the controversial yearly cull, which kill hundreds of animals each year, researchers say.